Adventures abroad are eye opening and exciting. Even if the desire to travel burns in your bones, don’t you appreciate a taste of home once in a while? Green tea ochazuke rice is what many Japanese turn to when missing home. Matcha ochazuke is the au courant rice bowl. The meal is simple. Thanks to the millions of Chinese restaurants around the world, Japanese travelers can easily make matcha ochazuke rice. 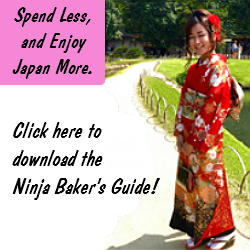 All that is required is a bowl of sticky white Japanese (short-grain) rice, green tea or matcha and a packet of ochazuke. What’s in an ochazuke packet? Seasoning tossed with dried seaweed and small rice crackers. The Japanese characters for ochazuke read as “steeped in green tea.” But refers to rice soaked in green tea and sprinkled with seasonings, seaweed and small rice crackers plus pickles. Matcha ochazuke rice is a simple but splendid feast for the palette. Delicate crunchy crackers accent soft rice. The slightly bitter tea balances the mildly sweet nori seaweed. Japanese pickles add a salty, savory element. Some may argue that an authentic matcha ochazuke rice bowl requires Japanese pickles. Shopping for Japanese pickles at some American markets may prove challenging. Solution: Hot dogs! That’s right. All-American Fourth of July hot dogs. 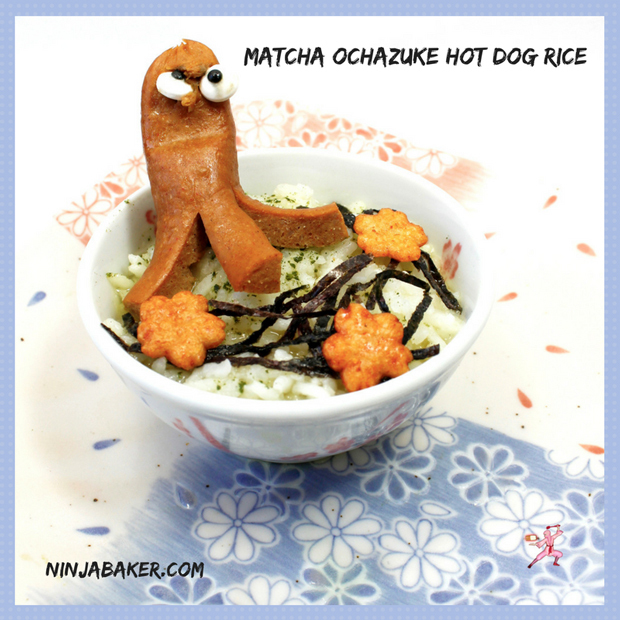 If this is your first foray into matcha ochazuke rice, why not skip the Japanese pickles and add familiar and flavorful hot dogs? After all, in America, July is National Hot Dog Month. Japanese travelers may bring their own ochazuke packets abroad. 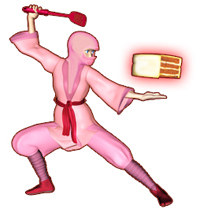 (Just as this Ninja Baker rarely boards a plane without peanut butter.) Handmade ochazuke is easy if you have access to an American, Australian or English supermarket. 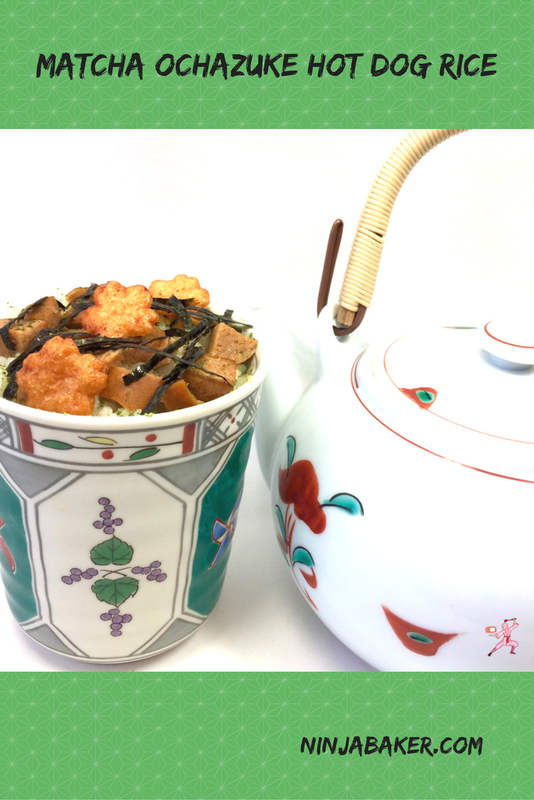 All you need is the aforementioned Japanese-style white rice, small rice crackers and green tea. In LA markets, it’s also easy to purchase the en vogue sheets of dried seaweed. Do you know if this is an LA thing or a new American fad? While creating an Asian fusion matcha ochazuke rice bowl, you might also like to add fried onion crisps. Even more crunch, sweetness and a bit of old-fashioned potato chip style grease are the gifts of the garnish! Fun Note: If you want to convince your children to try foods from abroad, Japanese matcha ochazuke rice bowl is a great place to start. Especially if you make octopus shaped hot dogs. The how-to is here. Many thanks to Stacy of Food Lust, People Love and Mary Ellen of Recipes, Food and Cooking for hosting this Sunday Supper celebration of National Hot Dog Month. Matcha ochazuke rice is indeed a simple but splendid feast for the palette. Delicate crunchy crackers accent soft rice. The slightly bitter tea balances the mildly sweet nori seaweed. Japanese pickles add a salty, savory element. If this is your first foray into Japanese matcha ochazuke rice, feel free to substitute more familiar flavors. Like protein-packed, slightly salty, kid-friendly hot dogs! P.s. If you want to convince your children to try foods from abroad, Japanese matcha ochazuke rice bowl is a great place to start. Especially if you make octopus shaped hot dogs. The how-to is here. Cook the hot dogs according to package directions. Pour the matcha green tea on top of the rice. Sprinkle with dried nori seaweed and Japanese rice crackers. 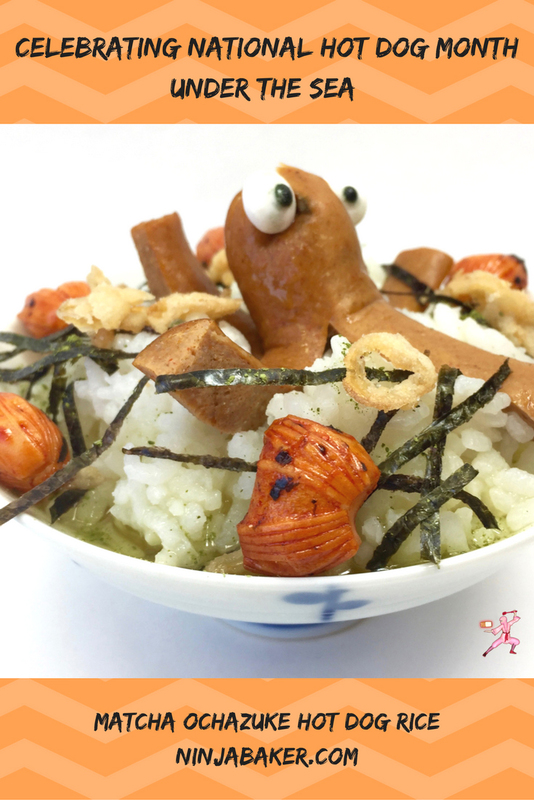 If desired also garnish with fried onion crisps and a soupcon of matcha powder. 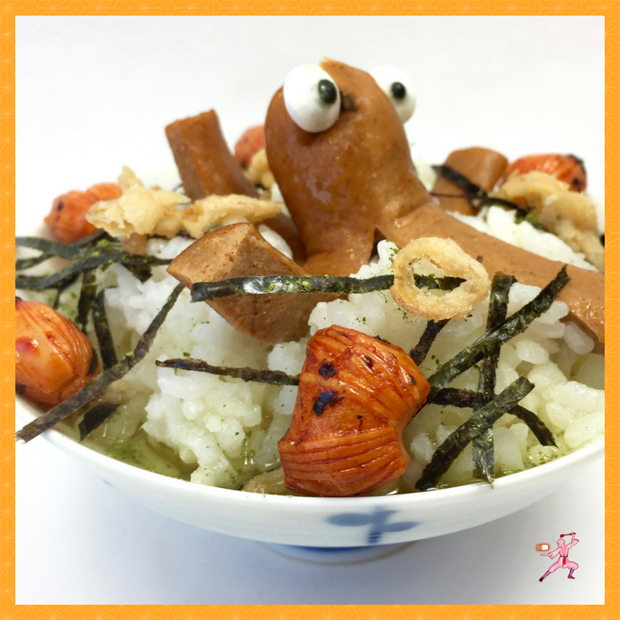 Top with a sliced or octopus shaped hot dog. Here are a few more Sunday Supper recipes starring hot dogs and celebrating National Hot Dog Month! Wishing you adventures abroad and at home.